I hope everyone had an amazing christmas and got everything they wanted! I got my Glymm box a couple days ago so I finally found some time to review the products. This month I got two Glymm boxes: one that I purchased and one that I won through stylishandliterate's twitter giveaway contest. I didn't expect to win, that's why I ended up with two. Anyways I gave one of them to my friend as a early Christmas present and kept one for myself. So in her box, she received an Annabelle Mascara, Lise Watier Flash Lift Radiance, Ahava Mineral Hand Cream, YSL Parisienne Fragrance, and Caudalie Eye Cream. Don't worry, I didn't ruin her surprise since she already opened it a couple days ago. As for what I got, it will be revealed to you below. I'm kind of surprised that in both boxes, my friend and I didn't get an information card. I like reading about the products that are featured and how much the full sizes are. That way I know the monetary value of the box just for the sake of knowing. I guess I have to Google the description and prices for this box. Also, I was expecting the box to be more holiday themed but the only thing that is remotely festive are the colors of the jelly beans. I think the red one is cherry, and I want to say the white one is... cream soda. Glymm should put that in their information card, I'm not very good at guessing flavors. Clearly my palate isn't sharp enough! Also, I love their bright pink box and the delicacy of their logo. Being such a packaging and graphics girl, they get bonus points for that. Woo! I got both my Glymm box and Luxebox by Loose Button today! So I'm going to share with you what I received from my Luxebox in this post and then review my Glymm box in the next. Sit back, relax, read and enjoy! So this is my third Luxe Box and I have been subscribed since they revamped their look and packaging, which is something I really like about Loose Button, especially the little personalized stickers. Unlike Glymm and Topbox who charge $10 plus tax per month, Luxe box charges $12 plus tax per month or $110 plus tax per year (so that's around $10 a month). I impulsively subscribed to a one year subscription because I guess I was sold on the fact that I would get two boxes free. 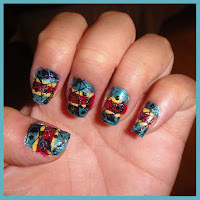 My friend came over the other day and she decided that she wanted to do her nails. While looking through my small array of nail polishes, she decided to test out my Shatter nail polishes. I bought both black and white one from a couple months ago and I have never used them. It was probably because I wasn't a total fan of just the shatter look. Don't ask me why I bought them, maybe it was because it was the fad at the time and I guess still is... Now I'm really into the magnetic nail polish and I hope I can get my hands on owning one of those some day. Before you read this review: Click here for a chance to win 5 full size products from brands that have been featured in past Topboxes ($250 value). If you're one of the unlucky gals that need to wait until May to get your Topbox, try your luck at this! The contest close on January 1st! I'm so excited to do this review since I wasn't expecting a December Topbox, because I thought that I didn't sign up in time. But I guess I made it just in time for the December Topbox cut-off date, so woohoo! If you are interested in reading my November Topbox review, check it out here! Two full sized products again! Benefit is running this amazing and unique campaign where they placed a bunch of posters with gift bags and mini christmas trees with a bunch of deluxe sized to full sized goodies. There were apparently 26 different locations where consumers could find these surprise bags around Downtown Toronto. When you follow Benefit Canada on Twitter and Facebook they will give you a hint on where to go to get some glamourous giveaways. Throughout the whole giveaway, I was giving this company really positive feedback because I did enjoy the thrill of a young women treasure hunt across the downtown core. But what it lacked was follow through with various locations that they stated that really ruined the experience. I'm not a fan of the word "Haul", so I'm going to use "Additions" instead. This week I've added a few nail polishes to my ever-growing collection. But I also had to throw a couple of them away because it got so thick that I couldn't even use it anymore. I even tried to use my OPI polish thinner, but to no avail. Oh well, it was probably at least 3 years old! Do nail polishes even have expiration dates or is just the users' call to decide when it's time to ditch it? Oh my goodness, the day has finally arrived! It's about time that I received my November Topbox. First and foremost, if you don't know what Topbox is, it is another beauty subscription service that delivers 4 deluxe size to full size samples for $10. The service is exactly like Luxebox by Loose Button, which deliver 3-5 products for $12/month and Glymm, which delivers 4-5 products a month for $10/month. Think of it like a magazine subscription but with beauty products. These services are all Canadian equivalents to Birchbox, which was the first beauty subscription service ever. I would also like to mention that it was started by two brilliant Harvard MBA women. They deserve all their success for coming up with such a unique and great idea. The first time I heard about this service was when I was watching The Globe & Mail's interview with the top young Canadian Entrepreneurs and they were speaking to Ray Cao, the CEO of Loose Button who was talking about his biggest splurge and what not. I was automatically intrigued by his cute company name and when I googled them I found out that their signature product was called "Luxebox by Loose Button". Anything with the word "box" will always appeal to me, just because I want to know what is in the box? So I Googled them, YouTube them, and got to know more about their service. I really liked what I saw so I enrolled in their subscription program. 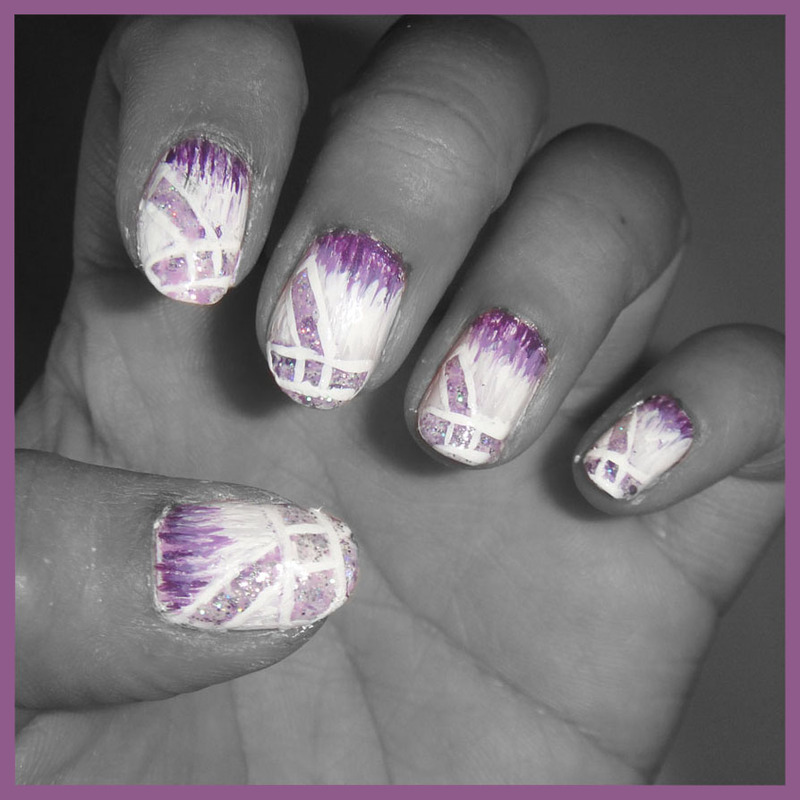 So finally this is what I consider "real-time" nail art since I actually completed it today after three failed attempts of trying to imitate other patterns. I finally settled on the Marchesa Ombre Fringed dress adorned by the lovely Serena Van der Woodsen (Blake Lively) in the Season 5 episode "Riding in Town Cars With Boys". I absolutely love Marchesa designs because it is always so elaborate, sparkly and always so beautifully constructed. I pray they will one day collaborate with H&M! As you can see that I posted up 3 blog posts of my nail art within days of each other. No, I didn't do them all in the same week or day. That would quite the waste of time and work! These are all nail art that I have photographed from a couple months back and that I'm super proud of. So this nail inspiration comes from "Belles de Jour" Season 4 Episode 1 of Gossip Girl. Blair wore this amazingly cute four-color Moschino Cherry dress from the Spring 2010 collection. I can't get over how incredibly adorable the print is! Again, another nail art inspired by Gossip Girl! 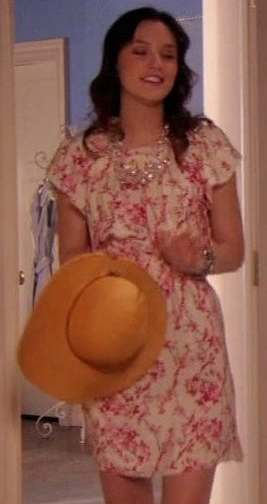 But this time instead of Blair Waldorf, it's Vanessa Abrams, everyone's least favorite character. Can I just say that I'm glad that she's gone and her "replacement" Charlie Rhodes/Ivy Dickens isn't really wowing me either. Yeah, I'm a bit of a fan of the show as you can probably tell. Anyways, this Pendleton Meets Opening Ceremony peacoat stood out to me because of it's bright colours and very bold markings. The colour combination reminds me of a colourful Native American headdress, while the black marking reminds me of tribal patterns. Quite the mesh! So this peacoat was featured on Season 4 Episode 10 "Gaslit" in case you want to find the episode and spot it. 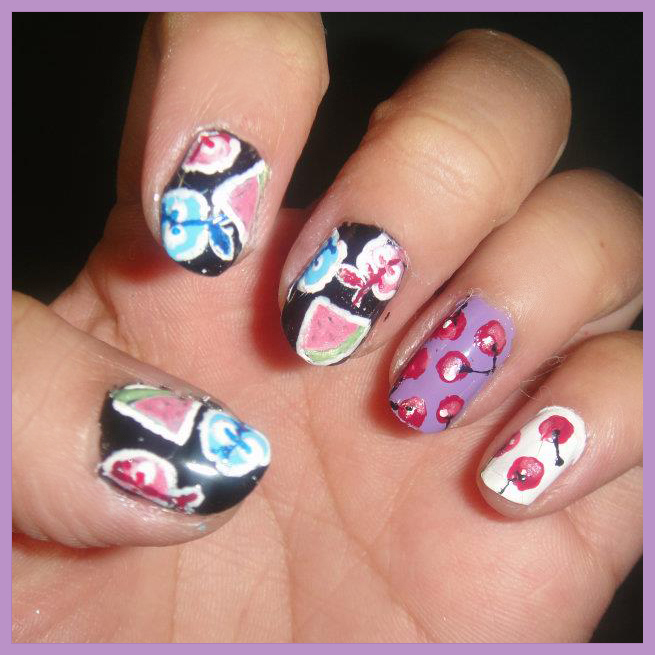 I've been doing nail art ever since I received my very first Konad Nail Stamping Kit when I was 14. I'm 22 now, so I've had a lot of practice and a growing collection of image plates. But there are so many people out there who can put my collection to shame. 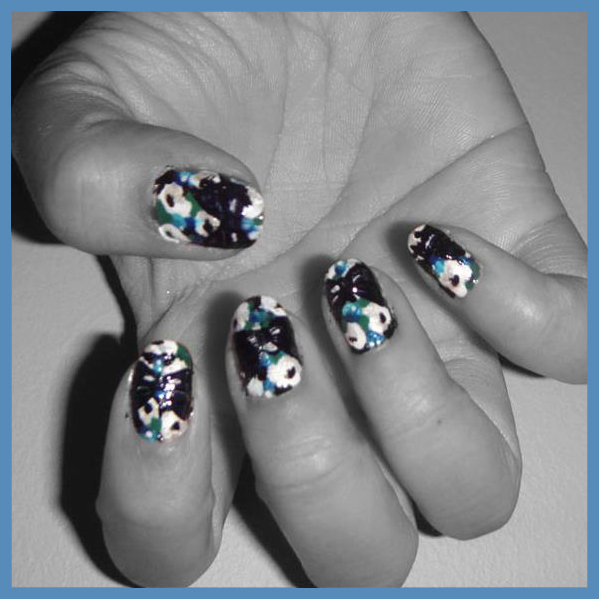 Most of my nail art posts will show you how I manipulate the image plates to resemble high-end fashion print patterns. I'm not going to lie, most of my inspiration comes from the clothes that Blair Waldorf wears on Gossip Girl. What can I say, they have an amazing stylist who knows how to combine different patterns and colours brilliantly! I wish I can afford all her clothes, but for now painting it on my nails will just have to do. I hope you enjoy this post and please follow my blog as I create more work of nail art. 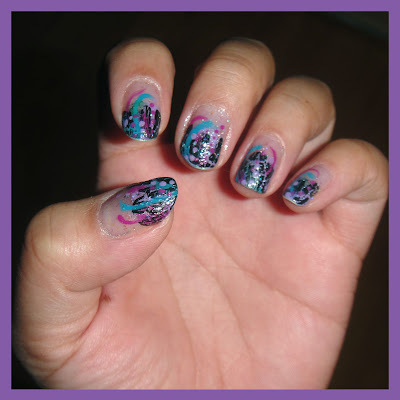 The inspiration of this nail art comes from Season 4 of Gossip Girl, Episode 87 "The Wrong Goodbye". Blair wears a beautiful Balenciaga Cherry Blossom dress and accessorizes with a chunky crystal bead necklace. 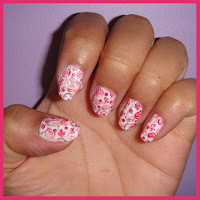 I absolutely love the floral print and that's what I decided to replicate on my nail.